Available in a lightweight hand held model or a bench model, thermal wire strippers are perfect for stripping solid and stranded wires up to 1/2″ OD. The HTS Series is especially effective on insulation such as P.T.F.E. and Teflon. The temperature at the stripping elements is variable up to 1400°F The bench model can be used for window stripping. Lightweight hand held thermal wire strippers for stripping solid and stranded wires. The HTS Series is especially effective on insulation such as P.T.F.E. and Teflon. The temperature at the stripping elements is variable up to 1100°F (594°C). The HTS1C has a cradle switch. 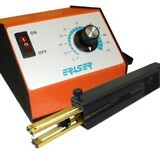 When the tool is placed in the cradle, heat to the elements is disconnected. The hand piece is only 7-1/8″ (181mm) long. A fiberglass brush is provided with each unit to clean the elements periodically. 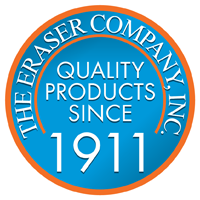 Eraser’s Model BTS1 Thermal Wire Stripper is a bench mounted thermal stripper for solid and stranded wire and cables up to 1/2″ OD (12.7mmø). The temperature of the stripping elements is variable up to 1400°F (760°C). 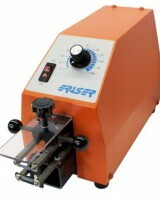 The unit has an adjustable strip length stop from 0 to 1-1/2″ (38mm) and has a self-contained fume extraction system. The optional 90° element kit is available to provide infinite strip length or window stripping.